Stauf laboratory testing and field installation tests have found some brands and constructions of Bamboo Flooring to be subject to product instability regardless of the type or brand of flooring adhesive used. We have found that any Bamboo Flooring may cup, twist, bow, end or center lift, expand or contract unevenly, require much longer time to acclimate to its environment, and sometimes react abnormally regardless of the environment. There is no one factor identified as to when this may occur. Specifically relating to “fused” or “stranded” Bamboo products wherein epoxies, resins, and various other materials are impregnated into Bamboo using a variety of methods such as heat and pressure, Stauf’s extensive laboratory and field tests lead us to conclude that these type constructions seem particularly susceptible to the product performance issues described above. Stauf USA, LLC, will warrant that specific Stauf adhesives* (SMP-940, SMP-960, CBR-970 & PUM-950) will permanently bond Bamboo Flooring to approved sub floors when installation instructions of both the flooring manufacturer and Stauf are strictly followed. While Stauf will warrant the bond of Bamboo Flooring to approved sub floors, Stauf USA, LLC, will not warrant the product performance of any Bamboo Flooring adhered with Stauf Adhesives. We specifically state that any cupping, twisting, delamination, excessive expansion or shrinking, end lifting, telegraphing of the inner plies to the wear surface, or any other product performance failure is excluded from our warranty. Any consumers who experience such issues must contact the Bamboo Flooring manufacturer for Warranty coverage. Should there be a situation in which the Bamboo floor has not bonded to the sub floor when an approved Stauf Adhesive was used and all installation instructions have been followed, the consumer should contact his dealer and follow the prescribed Stauf Warranty procedures. 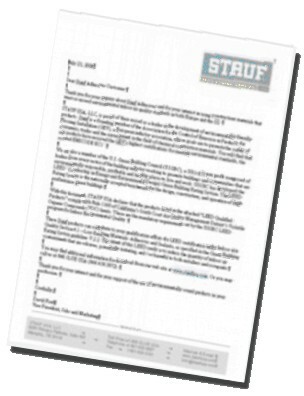 Visit the Stauf web site @ www.staufusa.com or contact Stauf with any questions.